Milka Zeiler Lichtenauer points to her grandfather’s name on a family marker in the Gerolzhofen Jewish cemetery. Three years ago, my cousin Milka Zeiler Lichtenauer and her husband Shmuel, who live in Israel, made it their mission to visit Gerolzhofen, the small town in Germany where Milka’s father and my mother were born and raised, and where the rest of the Jews were rounded up and killed in 1942. Milka had been in contact with the mayor of this town, and his wife, who coincidentally is a Jew – the only Jew who lives there. This woman has since uncovered much of the history of the Jewish population there and continues to work to educate those who live in this area. The mayor’s wife had learned what she could about the murdered Jews of Gerolzhofen. The more fortunate ones, Milka’s father and my mother, along with some of the younger cousins, left earlier. Their homes still stand, though lived in by others who know nothing of what happened there. Three years ago, a memorial stone was put up to commemorate all of those who fled and those who died. 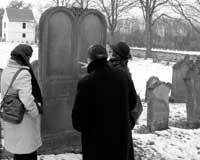 My cousin and her husband made the trip to this “ceremony” at the Jewish cemetery. It was stupidly planned for a Saturday and had to be changed to a Sunday out of respect for the Jews who planned to attend. During that time, Milka’s father was very ill. He was upset that she went to the town, yet somehow was able to put some closure on the emotional scars of his life. It was not until his own three children were grown that he told them his history and what had happened to his parents, grandparents, and brother. It was not an easy journey for her; it was full of tears and pain for what our parents and grandparents had suffered. I believe that what she did was a form of closure for all of us, especially for Milka’s father. He died the next year, ending the long chain of events that led him to Israel, then metaphorically back to Germany through his daughter. Even though much time has passed, we and, we hope, our children will continue to remember that place, that awful time, and those individuals who lost their lives and were lost to us and the future. A small, broken-down cemetery near the memorial looks much like a pile of rocks. My cousin found the grave of her grandparents and some others, but not of the uncle that had perished and those many others rounded up and piled into mass graves. The mayor’s wife brings schoolchildren to this cemetery each year and does what she can, along with her son, to educate them.